For the first time satellite technology has been used to make a census of global inland water cover. A number of 117 million lakes, reservoirs and wetlands of area >0.002 km2 have been found summing up to a total area of 5.0 × 106 km2, which corresponds to 3.7% of Earth’s non-glaciated land surface . This was not only an academic exercise as inland water surface area is one of the factors that determine inland water CO2 evasion . Increasingly, lakes are considered to play an important role in global biogeochemical cycling: they have been found to be an important source of atmospheric carbon dioxide and methane , , two important greenhouse gases, and also to be disproportionately important carbon sinks via carbon burial in lake sediments . It is not only the number of lakes which cover the Earth’s surface that is of global importance, but also their local extension. A digital map is needed to help distinguish one lake from another and also to distinguish them from other water sources such as rivers and the sea. A combined effort from the European Climate Change Initiative (CCI) has produced a global water bodies map  in form of an ‘image’ (Fig. 1) which specifies where there is water and to which water body it belongs. Again this exercise uses satellite data, differing from earlier comprehensive efforts which generated similar datasets, although not to the same level of detail, not from satellite data but from a variety of existing maps, data and information . Clearly efforts of this kind are often limited by the spatial resolution of satellite data and the impossibility of a systematic classification of all inland water due to their sheer number. Figure 1. Extract of the global water-body map. The area is around Lake Winnipeg in Canada. Each pixel belonging to the same lake has the same color. The colour white corresponds to ‘land’ and the black colour to ‘other inland water’. Each of the other colours corresponds to a specific classified lake (source ). The correct classification of an open water surface or a mixed vegetation area is key to the study of lake processes using satellite data. Satellite technology represents a powerful tool for assessing global lake characteristics that are important for studying other processes that occur in lakes. Lake ecosystems and the biodiversity they support are important components of the global biosphere. But their stability is threatened by climate change and anthropogenic disturbances . Figure 2. 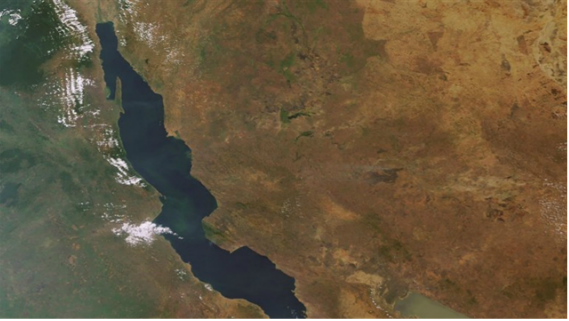 Lake Tanganyika from Envisat [source http://www.globolakes.ac.uk/] where the effect of warming has been studied and documented . The University of Reading, together with other institutions in UK, is attempting to measure and explain responses of lakes to environmental drivers at a global scale with the aid of satellite technology within the NERC funded Globolakes project. Lakes are fragile systems that are sensitive to many pressures such as nutrient enrichment, climate change and hydrological modification, making them important ‘sentinels’ of environmental perturbation. According to the Globolakes experts, evidence suggests that climate change might increase the spread of harmful cyanobacterial blooms , , being one of many possible negative feedbacks of a changing climate. Many studies have shown that the lake surface water temperature (LSWT) and the timing of spring phytoplankton blooms are related to meteorological signals. Generally, lakes are able to spatially and temporally integrate and amplify meteorological signals so that they act as useful sentinels of climate change . 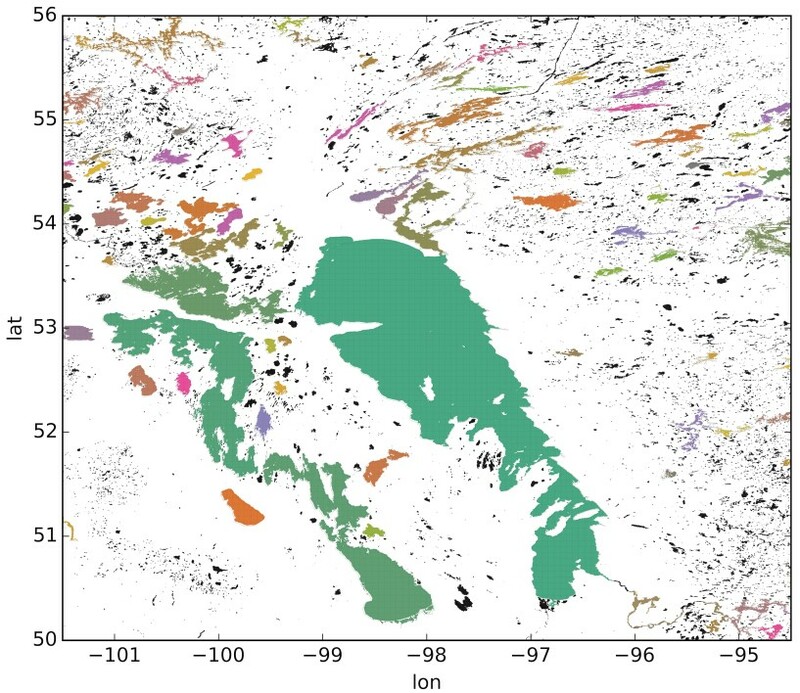 LSWT is considered an important parameter reflecting stratification  and mixing which are some of the main physical processes occurring in lakes , . Changes in temperature and, in turn, stratification influence the ecosystem directly (through differential population responses) and indirectly (via dynamic effects on nutrient distribution). Lake Tanganyika (Figure 2) is an example where warming effects have reduced the exchange rates between shallow and deep water (mixing), showing that warming has influenced the ecosystem . However, the current knowledge of global thermal lake behaviour is incomplete and past studies have reported temperature trends from either in situ or satellite data. Recently a big effort in analysing global LSWT trends from both in-situ and satellite data has been published . However, the results are for summer and for the lake centres only. Regarding the availability of satellite data, the ARCLake project has generated accurate and consistent spatially resolved LSWT time series for more than 250 large lakes globally from 1991 to 2010 , however some of the small and shallow lakes, which may respond differently to climate change , have not been included in the lake choice . Within the Globolakes project, a set of 1000 lakes have been selected  in order to have a collection of water bodies that span a wide range of ecological settings and characteristics but that are also suitable for remote sensing methods. The University of Reading is contributing to the Globolakes project generating accurate and consistent LSWT time series of high spatial resolution for the selected 1000 lakes. This entry was posted in earth observation, Hydrology, land use, Remote sensing and tagged lakes. Bookmark the permalink.